This 3 bedroom 2 bath home is located in the beautiful and private gated community of Vista Del Lago. It is just yards from the lake with amazing lake and mountain views. Large patio with fire pit and built in BBQ for evenings of fun and relaxing times. Very large master with TV and jacuzzi tub + large shower. One spare room boasts a queen bed and the other three full beds. All channels of direct TV included. Washer and dryer in laundry room. Huge kitchen with island for family cooking. All high end furnishings. Privet club house with pool table, pool, spa, putting green and horse shoe pit. Very impressive! We primarily live in Anaheim Hills, but love to go to Havasu. We boat and off road as often as possible. We love Vista Del Lago! We used to go to Havasu AZ and deal with the crowds... But once we went to Havasu Landing (before Vista Del Lago was built) we were hooked on this side of the lake. It's a shocker if you have to wait 5 mins. to launch your boat. It is so convenient. The small town environment with the nicest people is great too. Also, we love the casino. When we have people visit, it is usually the adults at the casino at night. Convenient, friendly, safe and very nice. Good times... every time! 2 full baths. Master is huge with walk in closet, large shower and large jacuzzi tub. fully stocked and very large kitchen. Great for family cooking. In master and living room. Direct TV with all channels included. Boat slips are available at Havasu Landing so you don't have to pull your boat out every night. We enjoyed the home and all the amenities it had to offer. Loved the house and location would stay there again. The location was excellent. 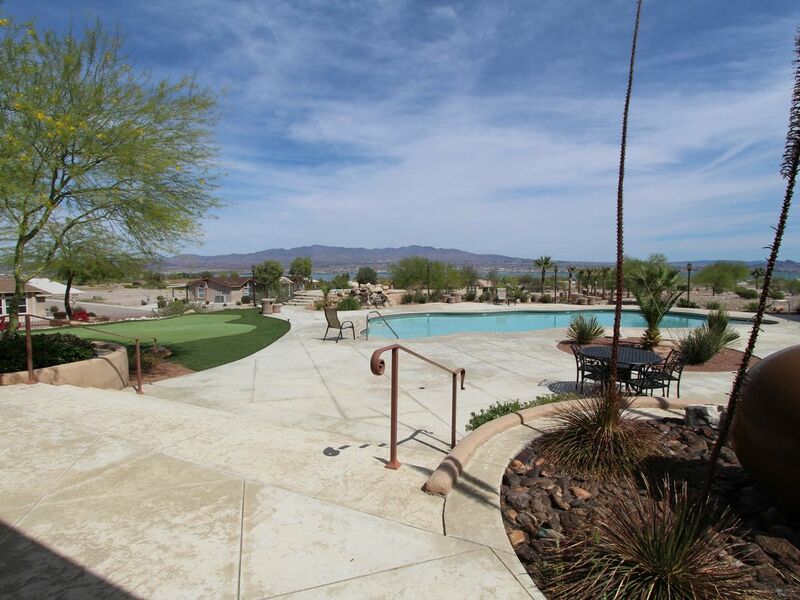 Quiet area with great views of Lake Havasu. The house had everything we needed. The kitchen was well stocked with cooking utensils dishes, pots, dish towels and cleaning stuff. Furniture was very comfortable. The club house with pool and hot tub was steps away and open all the time. Excercise room unavailable at this time due to vandalism. Only down side of the stay was no internet at house and wifi in the club house was poor. Beautiful view of Lake Havasu. Very nice people in Havasu Landing. I would let interested parties know that this home is not in Lake Havasu City. But the ferry is very convienent. Since we have done VRBO before, I would remove all personal items. Such as, clothing, food in refridge and freezer, have blankets on the beds and not just the comforters. It needs a good deep cleaning, carpet from kitchen opening down hallway and look behind all the window valances, lots if cobwebs. They were discovered when we tried to open the draperys and mini blinds and a lot we were not able to open, they were broken. Loved the size if the rooms and the master bed was very comfortable.